I hope you enjoy browsing through the various silk paintings. 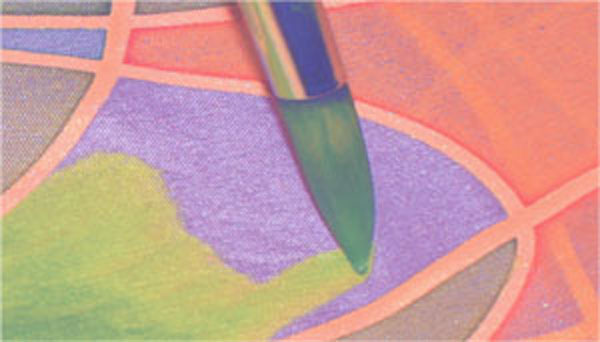 My trademark is the use of bold colors, and achieving a "stained glass" effect by using black resist. This is not silk screening, this is hand painted silk, using white silk as a canvas. Each piece is an original. The paintings are done on Habotai silk, using finest European silk dyes. Resist is used to define lines and set accents. The pieces are light fast and even washable (due to the process of setting the colors). The silk is stretched onto a padded board to ensure that the silk is protected, and to achieve a subtle 3D effect. I do not put my paintings under glass, since it is not necessary and would ruin the glow of the silk fabric. - The measures indicated do not include the frame. Photo of painting with frame available upon request. - Some of the paintings have received awards. Please check out the artist statement for more details. - All paintings are also available as prints and cards. - High quality photo prints are 8" x 10" and come in black or white mats 11" x 14" with backing, in clear sleeve, and are signed by the artist. - High quality photo cards are 5" x 7", white card stock, with envelope, in clear sleeve. Signed by the artist. Scarves are hand dyed, or hand painted, or both. Hand sewn edges. They always vary in color, and may have irregularities, which is part of the hand made, unique process, and of the silk. No two are alike. The scarves can be personalized by adding the recipient's name. Buyers may choose between gold, silver, or black gutta, except where indicated otherwise. Attention: The images of the scarves are just a few, due to fast turnover.